By nature, I am not a reasonable person. I have a lot of ideas, and lots of them are pretty “out there.” You might call them “outside of the mainstream,” if you were feeling charitable. More generally, the term “wacko” has been used. This way of playing with ideas becomes a problem, however, when I am in my role as rabbi, teaching. People seem to expect me to be reasonable. They expect me to reliably portray the “Jewish viewpoint” on issues, rather than my crackpot viewpoint. For instance, I am speaking this afternoon on a panel about Faith and Climate Change at Willamette University. I believe I have a creative and new idea, that speaks directly to the Jewish view of the imperfection of the world, contrasting it with original sin as the more typical Christian view. But, it’s a new idea, and I think it needs a little more review before being made public in quite so large a forum. The essence of the idea is this: Imperfection in the world, in the Jewish mystical worldview, comes not from human fault, but from Divine fault. That God, in creating the world, attempted to fill the universe with Divine perfection, but the universe could not contain that perfection, and shattered. Our task, as humans, is to go around finding the shattered remnants of this first creating, and release the film of God’s holiness which continues to cling to them. If I’m reading this right, it suggests that the imperfection of the world comes from Divine action, to be remedied by human action. In contrast, as I understand it, Original Sin is the idea that human action created imperfection in the universe by eating of the fruit of the tree of knowledge, to be remedied only be Divine forgiveness. The two ideas are seem to be inversions of one another, so to speak. I’m not sure I’ve got this logic right, but if so, I think it makes for some interesting speculation. I use gmail, firefox, and lots of other web 2.0 type goodies. Gmail, conveniently enough, lists keyboard shortcuts you can use to navigate. So I started trying to use them. But for some reason, they didn’t sink into my brain. A little background is necessary here: when I was in college and just after, I used Macs and then Windows 3.1, or Windows 95. And I knew ALL the keyboard shortcuts. The mouse was okay for those tasks you had to do once a day, or once every few days, but that’s it. All navigation, all routine tasks, I relied on the keyboard for. It was faster, easier and simpler. Over the years, I’ve kept the keyboard shortcuts I used to use, but more and more tasks seem to require the mouse. Or at least, I was using the mouse more and more. I thought it was the nature of technology, until I started hanging out with some programmers, and watched them flying around windows, never touching their mouses. They would hit the start button, followed by three other buttons pushed so quickly in succession that I couldn’t tell what they were, and they’d opened a new application. They’d use the little menu button…to reach all the “right click” controls. They fly! So it’s not the technology, which means. . .it’s me. I’ve started thinking about how it used to annoy me that older users would use the mouse so much, eschewing keyboard shortcuts. Didn’t they know they were faster? Now, as I’ve reached that age, I realize something is different. It’s harder to learn keyboard shortcuts. They don’t stick in my brain they way they used to. It used to be that someone would tell me about a keyboard shortcut once, and I had it. Now, I read about it, use it and I still won’t remember what it is (or even that it exists). My brain just isn’t storing new information as efficiently as it used to. There is an upside: my brain may not be as efficient as it used to be, but it has more experience to draw on. Some call this wisdom, though I prefer to avoid that turn. I’m afraid it might set people’s expectations too high. I prefer to refer to it as “reality testing.” With more experience of reality, I am better able to evaluate ideas against the real world, with less need to compare it to some platonic ideal which exists only in my head. Nonetheless, I do mourn the loss of efficiency my brain has suffered. I miss the ability to learn things quickly and surely. To hear something once, and remember it. To be able to remember whether I’m not remembering something because I’ve forgotten it, or because I never knew about it in the first place. I know this isn’t a new complaint. People have been complaining about their declining mental agility for a very long time. Nonetheless, I discover I never really expected it to happen to me. And as it does, I learn a new form of humility, wondering what else I think of as integral to myself, which will one day disappear. I made a hat for a little girl this weekend. She has a brain tumor (actually, she had one, it is now removed and she is recovering). Her mother works at CubeSpace, which is how I know her. She has a generally positive prognosis, which is great, but we want to do all we can to support the family through this tough time. So I do what I can. I pray and I knit. I’m not sure how much I believe that prayer has the power to make a difference in the material world. I’m pretty sure it helps the sick person to know that someone is praying for them, but I’m not sure I believe that God will send more or less healing to an individual based on my prayers. I’m not sure that God won’t either. So I pray. And I knit. I knit because it is a concrete act of caring. Making a hat for a little girl out of the softest yarn (alpaca, merino and silk blend) feels like a concrete way to help. Eva bakes, I knit. And as I knit I think about how I want the hat to warm her as she heals, and on through her life. It’s a knit hat, and children’s heads aren’t that much smaller than adult heads, so I’m hoping it will continue to fit her into adulthood. As I knit, I wondered (hoped) it would become a favorite, something that might see her through good times in life as well as this tough time. It’s blue–maybe she’ll use it for her “something blue” in a hypothetical wedding at some point in the future. 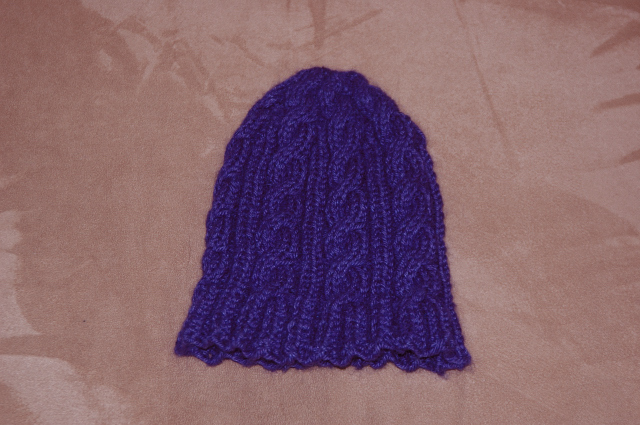 As I knit the hat I tried to knit in all the good thoughts I could. I tried to knit in prayers for healing. If will alone could make a hat an instrument of healing, this hat would be one. As it is, this little girl and her two mommies have lot’s of will, and I hope that the hat will keep her warm, feel like love, and, maybe, convey a little of the Divine presence. There is a certain sense of satisfaction that I get from solving a problem. It almost doesn’t matter what kind of problem it is: debugging a computer connection, figuring out how to help a customer or figuring out a lace pattern. There is a feeling of “I did it, and I’m proud of it” that results. I’m feeling pretty good at the moment because I just spent 20 minutes helping someone get hooked up to the wireless network. We have a very robust computer network at CubeSpace, both wireless and Ethernet. It is designed to enable people with a wide variety of computers to have access to the Internet and the networked printers. For the most part, it is very successful in that goal. Occasionally, however, people’s computers are set up in a way which prevents access. Usually it takes me less than 5 minutes to get anyone set up. Today, it took 20 minutes. Twenty minutes is long enough to develop a good head of frustration. And while frustration is not good in and of itself, as a precursor to solving a problem frustration adds to the sense of satisfaction. If a problem is easily solved, there is little achievement in its solution. Having been frustrated by a problem and solving allows a real sense of accomplishment. While I don’t suggest taking on frustrating problems on a regular basis, solving them is sort of like scratching an itch: it’s almost worth having been itchy just for the satisfaction of having scratched it. In the last week, my reading habits have shifted some. For months, most of my reading (I’m speaking here of books, not blogs) has been science fiction/fantasy. This is mainly escapist reading for me, with an undercurrent of social commentary/critique. (Just for reference, my favorite writer in this genre is L.E. Modesitt, Jr.). But in the past week I’ve been reading more deliberately spiritually oriented books. The first of these, which I am reading essays from slowly, savoring, is A Monk’s Alphabet, by Jeremy Driscoll. He is a monk, apparently working in a somewhat traditional genre of spiritual reflection, arranged alphabetically. I’ve only just dipped my toe into this, but find his reflections on life and the modern world, life and his ancient tradition, interesting and provocative. They push me to think about my life, and some of the things I miss in the everyday tumult. The second book I’m listening to on tape: Plan B: Further Thoughts on Faith, by Anne Lamott. I love the ongoing struggle she narrates between what she wants to feel and actually experiences. Even more, I enjoy her self-recognition of the moments where she crosses that line from “being spiritual” to smug self-congratulation for being spiritual, which all of us who seek to live a life of the spirit fight against. It is deeply reassuring that (to me, anyway) to have someone else name this flaw in themselves also, given that I all too often recognize it in myself. I would love to say that this spiritual reading is radically transforming my life. I could, in fact say (or write) this. But it wouldn’t be true. It is, perhaps, helping me to be a little more aware of the spiritual aspects of my day, the opportunities for helping others, the ways in which my life is intersecting with the Divine. But it is a slow process, which is taking place around the edges of life. Which is, after all, the main message of spiritual texts: It’s all about listening more closely to the everyday. Last week, I stood on the bima (the raised stage at the front of the synagogue) on a Sunday morning, in front of the Sunday school, during our weekly religious school prayer service, ripping back a shawl I was about a third of the way through with. I was ripping back dozens of hours of work. And I asked the kids how they thought I was feeling. I proceeded to explain that, in fact, I felt quite okay about it. I knit not because I am so invested in the finished garment, but because I like knitting. I was bored with this project, and didn’t think I would find it interesting as a piece of work once it was done. So I was ripping it out. 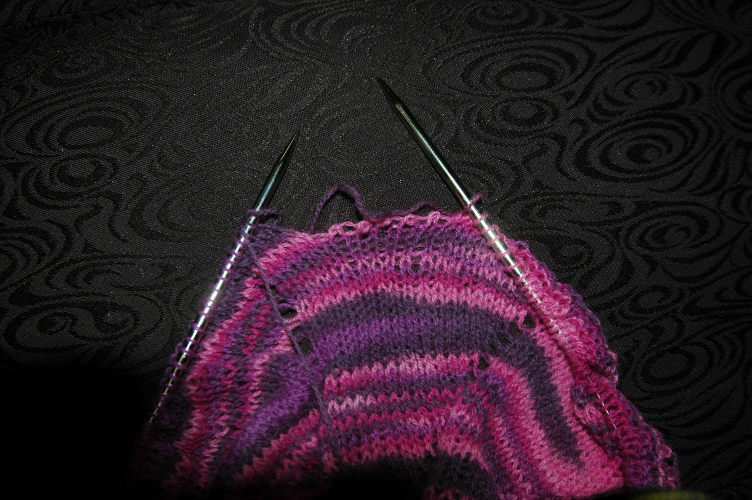 The key aspect, however, is that I knit for the sake of knitting, so by tearing back and using the yarn for something else, it provided me with even more opportunity to knit. The reason I was explaining this during a prayer service is that prayer is just like this. I pray not to get to some desired goal. I do not expect God to directly answer or “grant” my prayers. I do not do it so that I am suffused with a sense of peace and spirituality (though often I am). I pray because I enjoy praying, which is the best reason to pray. When you pray with some other goal in mind, there is always a significant chance of being disappointed. But when you pray because it is something you want to do, even if you don’t get a sense of peace from praying, it has not been wasted time. And even if I don’t enjoy every moment of prayer, like knitting, I continue because I know that, overall, I enjoy it, and sometimes you just have to push through the boring to get to the satisfaction. When you’re knitting a sock, there will be some 2 x 2 ribbing. When you pray, there will be times when it’s going through the motions. But you have to go through the motions to get to the times that you enjoy.